Reversing candles are a special type of candle which are comprised of two layers of wax. The inner layer is red, while the outer layer is black. However, they are just as often sold commercially in the form of what appears to be two joined candles. The top portion is red while the bottom portion is black (see image at left). They are used to send evil, curses, and general negativity back to the sender. When burned the red wax melts down on the black wax symbolically overcoming the evil. Reversing candles come in a variety of shapes and sizes including Tapers, Jumbo Candles, Vigil Lights, and Human Figural Candles. Set your stove to warm and place a sheet of tin foil on your bread pan. Using a knife or cheese grater (I suggest having a special one for just this purpose) remove the wick from the black candle(s) and cut/grate them up into tiny chunks on the tin foil. When you are done spread the pieces out evenly over the pan. Next, you can sprinkle dried herbs known for their reversing or protective qualities such as bay leaves, ginger, knot weed, devil's shoe string, red pepper, etc...You can also sprinkle specific sachet powders over the wax such as Reversing Sachet Powder. 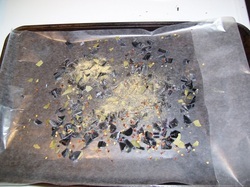 Place the pan in the oven and closely monitor the wax. 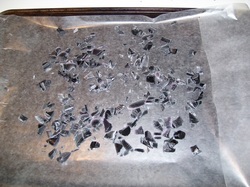 When it has melted, remove the pan from the oven. Just as the wax is beginning to cool, take your red candle and roll it in the wax (away from yourself) allowing the black wax to cling to the red. 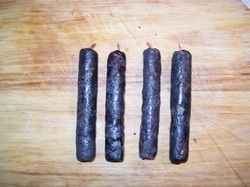 You will have to roll the candle as many as four times allowing the black wax to cool a bit between rolls. When you are done place the candles aside and allow them to cool. To use a Reversing Candle to return evil back to its sender, take a sharp knife and cut the wick off the top portion of the candle, turn the candle upside down and carve a new tip on this end. This is sometimes called flipping or butting the candle. Next, carve the name of the enemy on the candle so that the letters are reversed (see illustration above). Anoint the candle with Reversing Oil, or lacking that use Olive Oil that you have prayed over for this purpose. Set the candle in a holder and place the candle holder on a mirror. If you have a photograph of the enemy, write your petition on the back of the photograph and then place it under the candle-holder face down (so their evil will be reflected back to them). If you don't have a photograph, write a petition on a piece of brown grocery sack paper that you have cut into a square with scissors. Finally, light the candle and strongly pray that all the evil that has been directed at you be returned to its sender. When the candle has run its course you may inspect any left over wax for signs on the outcome of your work. Dispose of the ritual remains by burying them at a crossroads or tossing them in running water. Be sure to clean your tools (mirror, knife, candle holder, etc..) before using them again.